As many of you know, Brazil is known for it's love for soccer! Great, internationally acclaimed soccer players have come from the nation of Brazil and most Brazilian men are crazy about cheering on their favorite soccer team and watching the games. 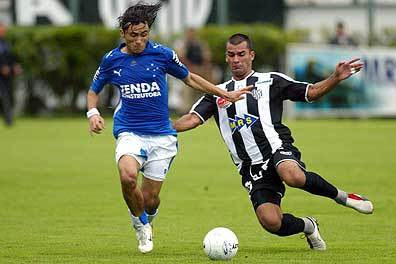 Many Brazilians play soccer well and have a passion for the sport! Recently there was a big championship game between the two most popular soccer teams here in the city where we live. At the end of the game, people were cheering across the mountainside, where all the homes of the slum are situated. Here at the Lighthouse Community Center we have soccer schools available for the boys from the community. Check out our friend Marcelo's blog to see photos and read about his work with the boys. Marcelo is an excellent soccer player and coach, and he has a heart to teach and instill godly principles and character in the boys he works with. God is using Marcelo and the sport of soccer to impact the lives of many boys who are living in at risk situations here in the slum. Please pray for Marcelo and the boys he works with!